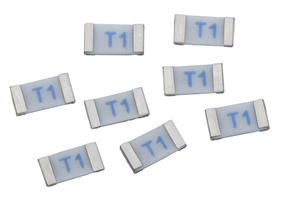 The C1T Series Slow Blow Chip Fuses are available in 1206 surface mount package in 6, 7 and 8 A ratings. The units offer primary and secondary level protection for electronics such as notebooks, LED/LCD monitors, personal computers, modems, routers, medical equipment and power supplies. They can be operated in -55°C to 125°C temperature range and come with 63 Vac with a 50A interrupting rating. The fuses meet UL, CSA and CE standards. Jersey City, NJ [October 16, 2018] Bel Fuse-Circuit Protection, a Bel group company (NASDAQ: BELFA and BELFB) and premier global manufacturer of fuses, announces their latest surface mount slow blow chip fuses, the C1T Series, (6 Amp, 7 Amp and 8 Amp), which feature a high current rating in the small 1206 surface mount package. These fuses provide board level primary and secondary circuit protection for a wide variety of consumer electronics (including notebooks, LED/LCD monitors, personal computers, modems and routers), office electronic equipment, industrial and medical equipment, power supplies, and PoE and PoE+ applications. Bel’s C1T Series fuses incorporate thick film chip technology on ceramic substrates, in the 1206 SMT case size, providing a low-cost solution that is also UL, CSA and CE approved, and carries the TUV certification to IEC 60127. Other highlights include 63 Vac with a 50A interrupting rating, a wide operating temperature (from -55°C to 125°C), and compatibility with the 260°C IR Pb-free and wave soldering process. Bel’s fuses carry the cURus certification mark for both the U.S. and Canada, are T&R auto-insertable, RoHS 2 compliant (MSL = 1), lead free and halogen free. The C1T Series is in stock with Digi-Key, Mouser and Arrow in up to 5,000 pieces on tape and reel for all ratings and types. Product samples also available upon request. Detailed information on the C1T Series fuses can be found here and the datasheet can be found here.